When he opened the doors of his workshop in Nuremberg in 1495, much of Dürer’s attention was directed towards designing serial imagery to be realised in woodcut and sold as bound collections on the open market. Unlike earlier illustrated books, where pictorial image and typeface were integrated on the same page, Dürer offered full (folio) page illustrations with the text on the reverse of each sheet. 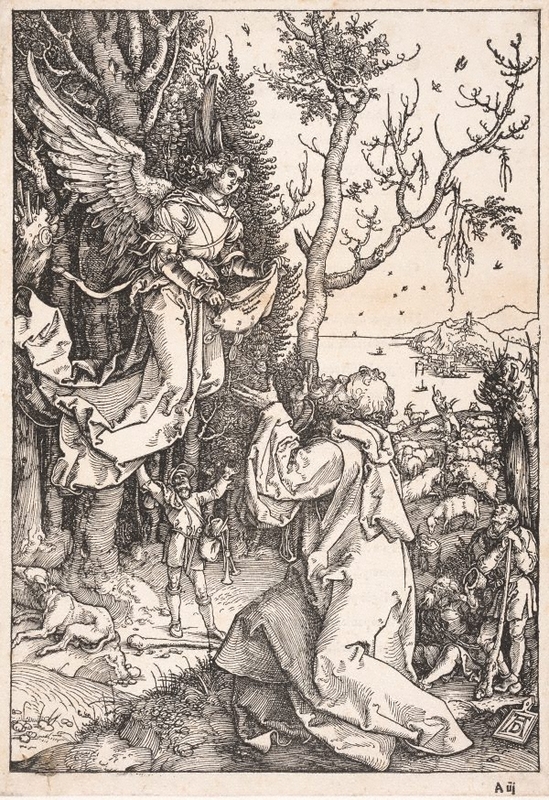 As well as using larger blocks than those in normal use at the time, Dürer’s woodcuts were also technically superior to any such preceding work; their compositional exuberance and wealth of detail, their animated, energetic lines and mastery of perspectival illusionism all marked a dramatic departure from previous examples. Dürer designed 17 woodcuts between 1502 and 1505 for his series The life of the Virgin, although in all likelihood he did not cut them himself since it was standard practice that the skilled task of cutting the block be relegated to a professional cutter. Dürer added two further prints in 1510 and in the following year published the set in book form, with a Latin text and frontispiece. The 19 woodcuts presented an intimate narrative of Mary’s life, moving from such episodes as her birth and betrothal, to the annunciation and nativity of Christ, and finally to her death, assumption and coronation. Since many of the prints appeared long before their publication in book form, Dürer sold a number of them as single sheets, without the text printed on the back. The Gallery’s impression of The adoration of the Magi (opposite page, right) is such an example. When it was published in 1511, The life of the Virgin was usually bound together with sets of Dürer’s Large passion and the reissue of the Apocalypse. The Latin verses accompanying the The life of the Virgin were composed specially by Benedictus Chelidonius, a Benedictine monk and theologian. The book was dedicated to Caritas Pirckheimer, abbess of the Franciscan convent in Nuremberg, whose chaste life, according to the preface, was a model of Marian virtue. In the Latin West the major source of visual imagery about the life of Mary was the apocryphal Gospel of Pseudo- Matthew, as well as the popular Golden legend by Jacobus de Voragine. These texts were ultimately derived from the Protoevangelium of James, an apocryphal gospel that, as well as being the earliest source to assert the virginity of Mary, also presented the story of her elderly parents, Joachim and Anna. When Joachim’s offering to the temple of Jerusalem is refused by the high priest because of Joachim and Anna’s childlessness, Joachim withdraws to the desert (depicted in Dürer’s print as a scenic northern landscape) to atone and fast for 40 days. An angel then appears to Joachim with news that his wife will bear a daughter. In Dürer’s representation this momentous message is conveyed by an official document hung with wax seals, which the angel carries. The angel instructs Joachim to return home, and after his moving reunion with his wife before the Golden Gate of Jerusalem, Anna conceives Mary. Extended pictorial cycles representing the life of the Virgin first appeared in the early 14th century, notably in the monumental art of Giotto, and were related to the widespread cult of the Virgin in the late medieval period. The immediate precedents in Germany for Dürer’s renditions are the engravings of Israhel van Meckenem and Martin Schongauer. Signed l.r. corner, [incised plate] "AD [artist's monogram]". Not dated. Piety and Paganism , Sydney, 1991, p 12. Albrecht Dürer [2 vols] , Princeton, 1943, vol I, pp 95-101, vol II, pp 37-38. Prints & drawings Europe 1500-1900 , Sydney, 2014, p 22, col illus p 23.